Hello, Dear Listeners. Have you ever looked at our logo and thought, “gee that’s a pretty bush and gibberish”? If that’s the case, then you’re in the right place, because in point of fact those are not bushes and none of it is gibberish! That’s why we’ve put together this helpful page to explain the various elements of our logo! 1 & 2: These are the Latin and Tengwar writings of the same word “athrabeth“. 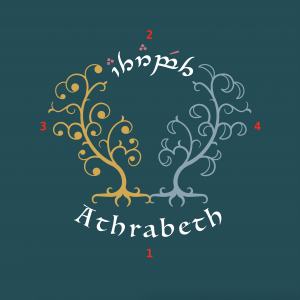 This sindarin word translates to “conversation” or “debate”, which is very appropriate for a podcast, but is also a part of the name of Jude’s favorite essay in Tolkien’s writings, Athrabeth Findrod ah Andreth, which we will be covering (hopefully?) some time around episode 8. 3: In the center of our logo are representations of the Two Trees of Valinor. On the left, we have Laurelin, the Golden Tree of Aman. 4: On the right, is a representation of her older brother, Telperion, the Silver Tree of Aman. Fun Fact! The White Tree of Gondor is a descendent of Telperion.